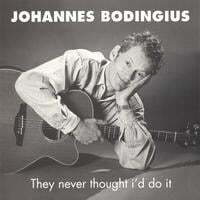 Johannes Bodingius brings different influences from jazz, blues and folk to rock & pop together in a tastfull mix of singer/songwritermaterial. Combined with his distinctive voice, it brings you an artiest who really stands out. For years this singer from Enschede, Holland has been performing around Europe with various Dutch, Frence and German bands meanwhile fine-honing his skills. His first solo album â€˜They Never Thought Iâ€™d Do Itâ€ (1997) was very well recieved. From up-tempo acoustic rocksongs to folky little tales; he's got them all! Romance and Rock coming together in catchy songs. An un-suspected gem from the Netherlands!